Sri Adichunchanagiri Mahasamsthana Math situated on a rocky hillock about 110kms west of Bangalore, the capital city of Karnataka from times immemorial has been a place of vivid scenic beauty. The lush green woods and serenity of the lakes provide a sanctified atmosphere for spiritual aspirants to meditate and the seers to internalize themselves. Amidst this serenity stands the Adichunchangiri Mahasamstana with Lord Gangadhareshwara as the presiding deity along with four other avatars/incarnations of Lord Shiva in their ferocious forms for demolishing the Demons & the unrighteous viz Lord Malleshwara, Lord Kattale Someshwara, Lord Gavi Siddeshwara & Lord Chandramouleshwara. This temple complex also comprises other deities like Sri Ganapathi (the prototype for all religious rites), Sthambhambika Devi (Counterpart & source of Energy to Lord Shiva) , Sri Subramaneshwara (divine army chief) , Mallamma Devi and many others. This vast premises including the temple complex and the surrounding area, famous as Sri Kalabyraveshwara Kshetra attracts thousands of devotees and tourists from all parts of India and abroad. The other temples in this kshetra like the Pancha Lingasannidhi (5 symbols of Lord Shiva), Jwala Peetha( place of penance), Nagalingeshwara Sannidhi also consecrate the environ and bless the devotees arriving here. This Holy Kshetra finds mention even in the ancient Shiva Purana and other scriptural literature. As the famous legend goes Adi Rudra awarded this place to Siddha Yogi who established Siddha Simhasana and the archetype Math. Later this place due to the penance and endeavor of many great sages grew up to be the present Sri Kalabyraveshwara Kshetra. Though this ancient ‘Dharma Peetha’ with a history of 1500 yrs, has been preserved and succeeded by many great seers and sages in the past who have contributed widely for the Indian heritage, it gained momentum reaching the masses and was popularized only after 1974 when its 71st pontiff His Holiness Jagadguru Padmabhooshana Bhairavaikya Sri Sri Sri Dr. Balagangadharanatha Mahaswamiji took his vow of Sanyasa (renunciation) and succeeded the lineage of Nath Parampara in 1974. From then the Adichunchanagiri Math has involved itself in numerous activities encompassing all the sections of the community viz Educational, Socio-cultural, Economic, Health, Vocational and so on. His Holiness Sri Sri Sri Dr. Balagangadharanatha Mahaswamiji dedicated his whole life for the service of mankind. 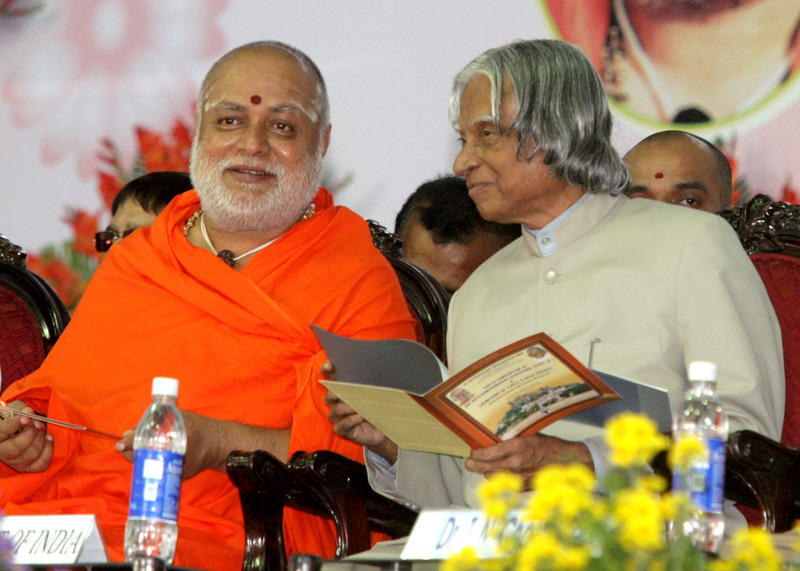 He strongly believed in Karma Yoga and tirelessly worked for the betterment of the Society. The Adichunchangiri Mahasamstana being the apex body has many trusts working under its assistance patronizing and providing services in varied sectors. Through Adichuchanagiri Shikshana Trust, the Math aids more than 450 + Educational institutions. Free and General hostels in almost all District Head Quarters provide boarding and lodging facilities for poor students. The Math also runs schools for the visually disabled children in Ramanagar district as an endeavor to bring light in the lives of these children. The Math under the able guidance of His Holiness involves in various Spiritual and Socio-Cultural activities. It has established about eight schools which imparts Sanskrit & traditional Education. Activities are also taken up for propagation of Vedas and other Scriptures which are enriched with Knowledge. The Math is also actively involved in creating awareness about the preservation of Environment and empowerment of Women in the Public. Several Jana Jagruthi Shibiras (Mass awareness camps) and Mahila Sabalikarana Shibiras (Women Empowerment camps) have been conducted in many cities from the Math witnessing huge participation and appreciation as well from the people.